Sometimes, an app just needs to do exactly what you want it to do, and to match its description in the store. We have had a few apps reviewed here recently that have not even managed to do what they claimed to do, so when we are asked to review an app titled ‘101 Animal Puzzles for Kids’, it is something of a relief to discover that it lives up to its own name. Yes, there are indeed, 101 animal puzzles here and they are clearly aimed at kids. In all seriousness though, this app has obviously been designed with a lot of love by the developer, as each of the images and puzzles are well characterised, which is surprising given the large amount of content here. All the animals look decent and are in attractive scenes to provide plenty of interest for kids. 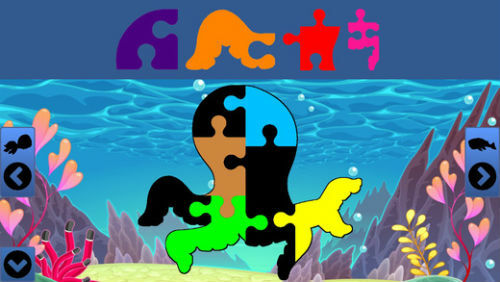 The missing pieces are arranged along the top of the screen and the child simply has to put them into the correct places. Kids can skip puzzles they don’t like and go back to their favourites at will, and there is full voice work throughout with each animal introduced uniquely. The really cool aspect for parents is the ‘grown-ups menu’, which allows you to tinker with the game to get it to the correct difficulty for your child. The game has a great sliding scale for automatic difficulty adjustment, which means you can set it to take away pieces if the child is struggling, or to add more to the next puzzle if they are finding it too easy. There are also settings for the way the puzzle pieces are dragged and dropped if your child is struggling to play the game. With a bright cheery outlook, plenty of puzzles and highly intelligent difficulty options, there is a lot to like here for parents with kids that love puzzles and animal. Well worth a purchase, this comes highly recommended.